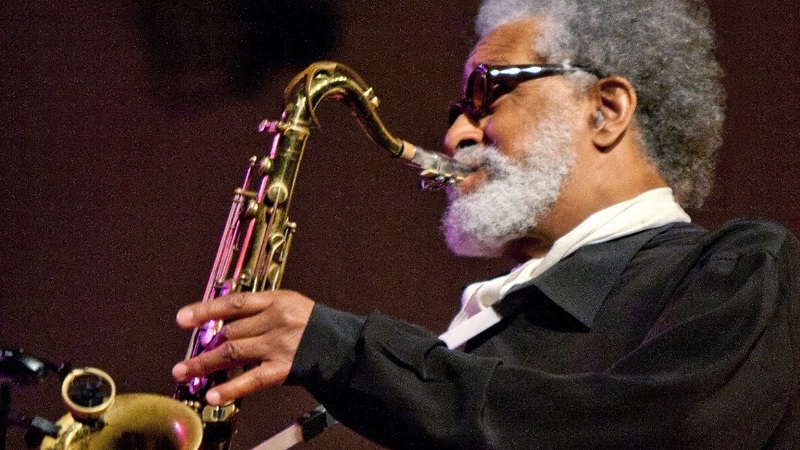 After 7 Decades, Sonny Rollins Can't Get Music Off His Mind The legendary saxophonist, who recently donated his personal archives, speaks with Christian McBride and Audie Cornish about improvisation, innovation, mentorship and legacy. 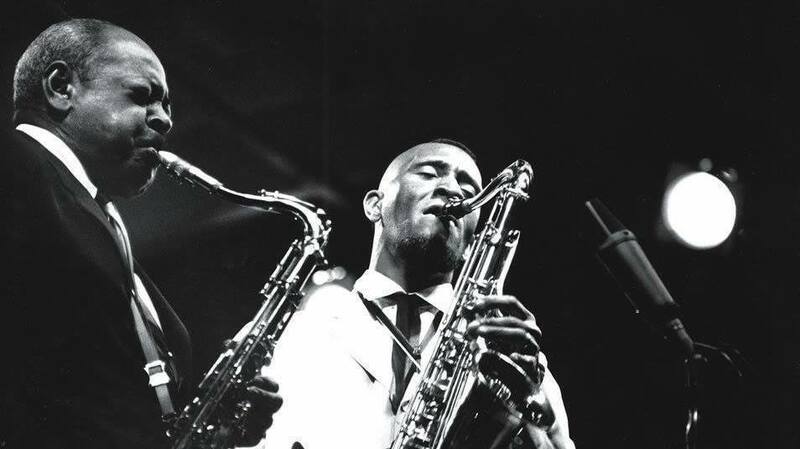 "If you hear the music, you don't have to be there looking at somebody's body," Sonny Rollins says. "His music is here. All the time." Everyone knows the legendary names of 20th-century jazz, but there are only a handful of those greats still around to tell their stories. One of them is saxophonist Sonny Rollins. He recently donated his personal archives, which cover a seven-decade career, to the Schomburg Center for Research in Black Culture at the New York Public Library. NPR's Audie Cornish and Christian McBride, bassist and host of NPR's Jazz Night In America, spoke with Rollins about his collaborations with fellow jazz legends, the unseen work that goes into improvisation and the contents of his archives. Rollins began by talking about his childhood in Harlem, and how he took up music when he was just 7 years old. Read on for an edited transcript. Sonny Rollins: When my mother got me a saxophone, of course, you know, I mean, this was Depression time. It took her a while for me to convince her that yeah, I really want to play. ... But anyways, when she got me my saxophone, she got it from an uncle I had that played saxophone in Harlem. So she got me this used horn. So boy, I got this horn, man — I went in a room, I shut the door and I was in heaven. My momma had to knock on the door: "Sonny, Sonny, it's time to eat dinner, come on!" I didn't know what I was doing on the horn, but I was doing it! I heard a lot of music around me when I was growing up, being born in Harlem. That's another significance of the Schomburg collection. Because Harlem was Harlem, in those days. There was something happening every place you looked. There was of course the Cotton Club, there was the Savoy Ballroom. Musical venues abounded. Back in the '30s, when I grew up, Harlem was sort of the epicenter. All of the black jazz kings resided up there. Audie Cornish: So was it a matter of sneaking into these clubs? We used to go down to 52nd Street and I used to go hear Charlie Parker, but I had to put on — You know we got this black stuff that women put on their eyebrows? Christian McBride: Oh, to make a fake mustache? Right! Make a fake mustache. Now, I don't know if I was fooling nobody, but I don't think they cared too much. [Laughter.] But they let us in. 52nd Street, I used to go in there and have my fake mustache and go in there to listen to the great Charlie Parker. Cornish: Can you talk to us a little bit about what kind of papers you've turned over? Is there a particular item you're really excited for scholars or people to see? 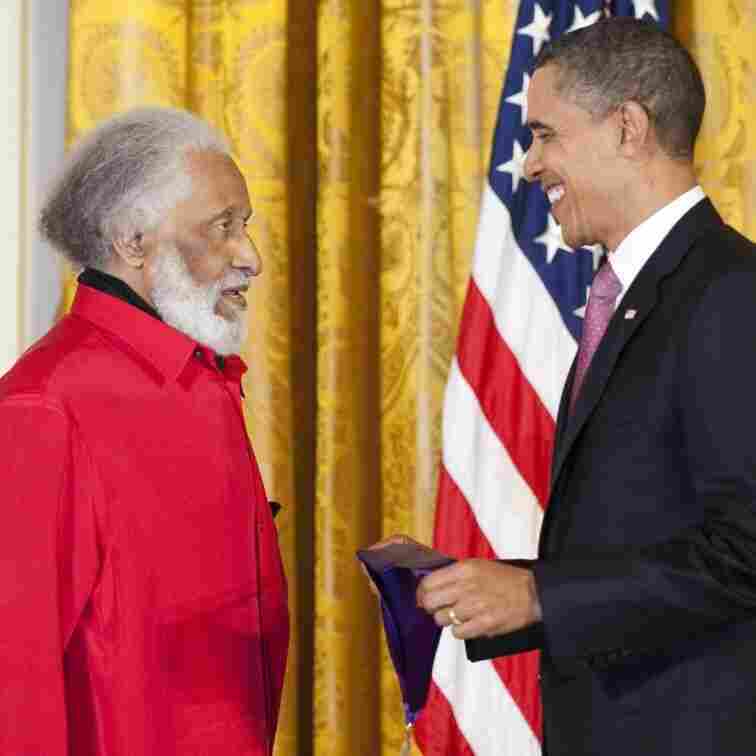 President Barack Obama presents Sonny Rollins with the 2010 National Medal of Arts. Well, I had a lot of music notes. I'm constantly trying to learn music and teach myself. So I had a lot of little notes to myself of patterns, things that I had difficulty playing — how to do them myself. And there's some music books there. There's some personal notes between myself and my wife. There are a lot of personal things there. It really comprises a long period of my life. And when the truck pulled away from my home with all that stuff, I felt, "Well, wait a minute. There I go. I'm going with that. Am I here? I don't know." I'm there with the archives, and I'm here in my home. It was a very interesting experience. Cornish: You mentioned that some of the notes are things you were teaching yourself. That's interesting because people always talk about you as the great improviser. They think of improvisation as something where people are never writing anything down, and your archives show the opposite. Well, I considered myself maybe — 80 percent self-taught. So I had a lot of instructional things for myself that enabled me to improvise. I have to have my basic material there. Then comes the next step, which is improvisation. McBride: You said you were 80 percent self-taught. I'm curious about that other 20 percent. Was there a particular [person] who acted as sort of a mentor to you? A saxophone mentor? I know how much you love Coleman Hawkins, but was he primarily your main man? Well, he was primarily my main idol when I first really got into him around 1939. But I'm happy to say that all of the people that I encountered, the older guys, they were all wonderful mentors for me. All these guys. J. J. Johnson, the trombone player. Oscar Pettiford, the bass player. Max Roach, the drummer. Of course, Thelonious Monk, piano. So all of these guys, they all showed me. They all mentored me. I really learned a lot from being around them. Coleman Hawkins (left) and Sonny Rollins. Cornish: It's hard to think of you, Sonny Rollins, as someone who feels like you're constantly having to learn. Because you were a prodigy, right? Out of high school, you were already a pro even though you hadn't been to any kind of formal music education. Right, right. Yeah, no, I started — I think I first played with Miles Davis in 1948. And then I played with Monk around that time, in the '40s. There I am with these gods of music. So I had a gift. Because for music, you had to be gifted. It's not a matter of your intelligence or anything. You have to have a gift. Just as, I'm sure, for other professions. ... And then I came upon these very great and — not just great musicians, but great people. ... And I'm trying to now live my life like that. I've got a gift, a musical gift, fine. But I want to be a human being, a good human being. I need to always express that to young students. Everybody can have a gift. That's a gift. But then we have to be good human beings. So that's what it's all about. McBride: I want to ask you about one of your many innovations: the piano-less trio. Just the saxophone-bass-drums trio. How did that start? Why did you do that? McBride: Did somebody not show up for the gig or something? No, see, the thing is this: I was fortunate to play with great piano players in my time. However, I felt that I could concentrate on my own stream of thought better without a pianist. I just wanted to not be led — it's hard not to be led by a piano. ... In my playing, I always felt more free, to be able to go places my mind took me, without having a piano say, "Hey man, go from this chord. Go to the fourth there. Go to the seventh there." Which is good, I mean — it's nothing wrong with that. But I felt freer, just going there myself. And when I have a great bass player, like yourself, and a great drummer, that's all I need. I need the rhythm and the rest of it, I wanted to be free to hear whatever was there to be heard. McBride: There you go. That was beautiful. Christian? Now you're going to have the piano players be out to get me now. Cornish: With the exception of Roy Haynes, you have lived long past many of the greats that you worked with, even the ones that came after you. What has that been like? What do you see your role as in terms of carrying forward some of these legacies? Well, I have been so fortunate, you know. I played with — oh, boy. I played with Coleman Hawkins, I played with Lester Young, saxophonist. I played with Don Byas, I played with Dexter Gordon. I played with some of the younger — Jackie McLean, Ornette Coleman. And then I played with trumpet players: Miles, Dizzy, I played with the great Fats Navarro, one of the great trumpet players. And Kenny Dorham. When I look back on the people that I've played with, it's unbelievable. It was such a great thing. And actually, you know, they are not physically here, true. But they are here. See, I can wake up and think about Miles any day, any minute of the day. Oh, think about something he said. Think about something he played. Think about Monk. Those guys are here with me, even though they're not here in the body. But you know, we have a saying in some of the disciplines that I follow that says, "I am not the body." I am not the body. That's very important. And that's very important when speaking about people — great artists, great personages that I have been on the planet with. They are still here, to me. All of 'em. All of 'em. And Christian knows what I'm talking about. Because if you hear the music, you don't have to be there looking at somebody's body. His music is here. All the time. McBride: And it feeds the soul. It feeds the soul. Yeah. We got Beethoven, you listen to him. I don't care that his body ain't been around here for a long time. Doesn't mean anything. McBride: That's very true. Mr. Rollins, I wanna ask you: Are we gonna hear some new music from you soon? Well, Christian, I had a little health issue and it sort of got me away from playing. I mean I had to go through quite a period of adjustment after I realized that I couldn't blow my horn anymore. ... But I'm thinking music — I can't get music out of my mind, think about it all the time. And maybe I'll find some other way to express the music that I have in my mind. But I don't know, because my saxophone was so much an integral part of everything I thought about and expressing sounds — it's difficult to do it on another instrument. But I don't know. Maybe I might start singing, who knows? Watch out!